Today's U.S. Open women's final should be remembered for Naomi Osaka's outstanding performance and first Grand Slam title. Instead, it will be recalled for yet another tirade by Serena Williams. Osaka, 20, defeated her idol Williams 6-2, 6-4 in Flushing Meadows, N.Y., to become the first Japanese player, male or female, to win a major singles crown. The 20th-seeded Osaka beat the 17th-seeded Williams at her own game, out-serving the part-time Silicon Valley resident, outslugging her from the baseline and playing better on the big points. Osaka had six aces and one double fault, put in 73 percent of her first serves and converted 4 of 5 break points. Williams finished with three aces and six double faults, put in 55 percent of her first deliveries and capitalized on only 1 of 6 break points. Williams was warned for receiving coaching from Patrick Mouratoglou in the second game of the second set, assessed a point penalty for smashing her racket after losing her serve for 3-2 in the second set and docked a game for 3-5 for telling chair umpire Carlos Ramos, "You stole a point from me. You're a thief, too." This was Williams' third major clash with an official in the U.S. Open, which she has won six times. She was fined a record $82,500 and placed on two years' probation for threatening a lineswoman ("I swear to God I'll ----ing take the ball and shove it down your ----ing throat.") in the 2009 semifinals and $2,000 for berating a chair umpire ("You're totally out of control. You're a hater and you're just ... unattractive inside.") in the 2011 final. Williams lost both matches. As ESPN commentator Tom Rinaldi began today's awards ceremony at 23,770-seat Arthur Ashe Stadium, the pro-Williams crowd booed, causing tears to roll down Osaka's cheeks. Williams then told the crowd: "I know you guys were here rooting, and I was rooting, too, but let's make this the best moment we can. ... We're going to get through this, and let's be positive. So congratulations, Naomi. No more booing." After receiving her trophy, a subdued Osaka said: "I'm sorry. I know that everyone was cheering for her, and I'm sorry that it had to end like this. I just want to say thank you for watching the match. "It was always my dream to play Serena in the U.S. Open final, so I'm really glad that I was able to do that. I'm really grateful that I was about to play with you. Thank you." Osaka improved to 2-0 against Williams, having won 6-3, 6-2 in the first round at Miami in March. It was Williams' second tournament after giving birth to her first child and enduring life-threatening complications. Williams, who will turn 37 on Sept. 26, has lost meekly in the final of the last two Grand Slam tournaments in an attempt to tie Margaret Court's record of 24 major singles titles. She fell to Angelique Kerber 6-3, 6-3 at Wimbledon. 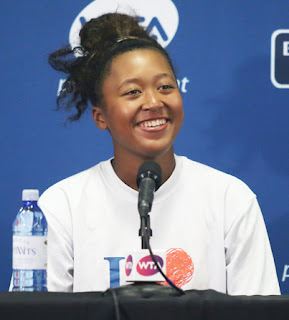 Osaka was born in Japan, has a Japanese mother and Haitian father, and lives in Boca Raton, Fla. She is coached by Williams' former hitting partner, Sascha Bajin. Williams won the Bank of the West Classic at Stanford three times (2011, 2012 and 2014). Osaka's first big win came in the 2014 tournament, which moved to San Jose this year under a new sponsor, Mubadala. As a 16-year-old qualifier playing her first main-draw match on the WTA tour, Osaka ousted 2011 U.S. Open champion Samantha Stosur 4-6, 7-6 (7), 7-5 in the opening round at Stanford. Osaka saved a match point in the tiebreaker and overcame a 3-5 deficit in the third set. She then fell to No. 8 seed Andrea Petkovic. Men's singles -- No. 3 seed Juan Martin del Potro is scheduled to face No. 6 Novak Djokovic for the title on Sunday at 1 p.m. PDT (ESPN). Djokovic, a two-time U.S. Open champion and five-time runner-up, is 14-4 with a three-match winning streak against Del Potro, who has undergone four wrist operations since stunning Roger Federer for the 2009 crown at Flushing Meadows. Mixed doubles -- Bethanie Mattek-Sands of Phoenix and Jamie Murray of Great Britain nipped Alicja Rosolska of Poland and Nikola Mektic of Croatia 2-6, 6-3 [11-9] for the title. Both teams were unseeded. It was the fourth Grand Slam mixed doubles title for Murray and third for Mattek-Sands but their first together. Mattek-Sands suffered a gruesome knee injury at Wimbledon last year and missed eight months. Boys singles -- Lorenzo Musetti, a 16-year-old Italian, beat Jenson Brooksby, 17, of Carmichael in the Sacramento area 6-3, 6-3 in a semifinal matchup of unseeded players.